To make this blog ready for wider distribution, I ran a 99Designs campaign to design a new logo for Wouter.org. I have the impression that game theory is well at work here, and the results I’m seeing are because 99Designs set up the rules of the game in a specific way. As the campaign starts, the client (me) is instructed by 99Designs to give the designers low marks. I suppose the intent is to prevent you giving the highest marks immediately, and then there is no way to exceed them, but this way early submissions get penalized just for being early, even if they are great. I frequently went back to earlier designs to check if I should not actually increase their rating. 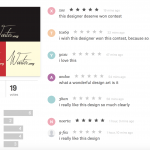 Apparently designers can see each other’s designs and my ratings of those designs. The designers follow a strategy of going for the path of least risk of offending me (and not the path of the greatest difference). 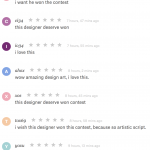 As a result the earlier designers have the cost of finding a style that gets high scores from the client, and other artists then copy or expand only on that. The result is a lot of the same designs, and earlier designers risk being ripped off. Then again, the earlier designs do get more attention from the client and more chances to adapt the designs. I’ve had several “designers” that blatantly submitted replicas of earlier submissions. Part of this is of course, natural evolution, part of this does seem… opportunistic to me. I think the only real way to counter this a bit as the client, is to give comments to designs, but no ratings. This might work because the comments are not visible to the others, but the changed designs will be. Near the end of the first phase, there was a clear “ballot stuffing” moment, where artists put up a series of very similar designs or even the same logo in various angles, in an apparent attempt to crowd out the others. Another attempt to garner more attention, was sending standard or effectively empty messages. Apparently “.” is the smallest message allowed to be sent, as it brings up the design also on the messages. This didn’t surprise me to see: designers did of course vote for their own design in the poll (again, apparently the polls are also not hidden to the designers). So, I was wondering just how I could turn this blatantly opportunistic behaviour to my advantage as a client. I don’t think you can use the brief (the initial instructions to the designer) effectively: only a few of the artists read the brief (it explicitly told the designers to not mimic handwriting if it was not mine, which a lot did not follow). Only one explicitly referred to the brief’s content, and included an appreciation of this (he is also the original artist using my own writing and the red “.org“, and did not end up updating his design so did not make it to the finals). I could not find a “ban this designer” or “mark this designer as …” mechanism for feedback. I have no idea how feedback works in this domain. All in all I got a good logo out of this exercise, helped significantly by help by the readers. However, if you know a good graphics designer, or know someone who knows one, I’d advise going that route. This isn’t particularly cheap and in the end the whole group behaved as a single designer anyway.